‘Who assumes responsibility for Europe?’ – Samstag, 11. November 9:00 – 18:00, Radialsystem V, Holzmarktstrasse 33, 101243 Berlin. um 14:00 Uhr nehmen wir die Teil in einer Podiumsdiskussion. A Soul for Europe and Cities for Europe host the ‘A Soul for Europe’ conference 2017 under this slogan. 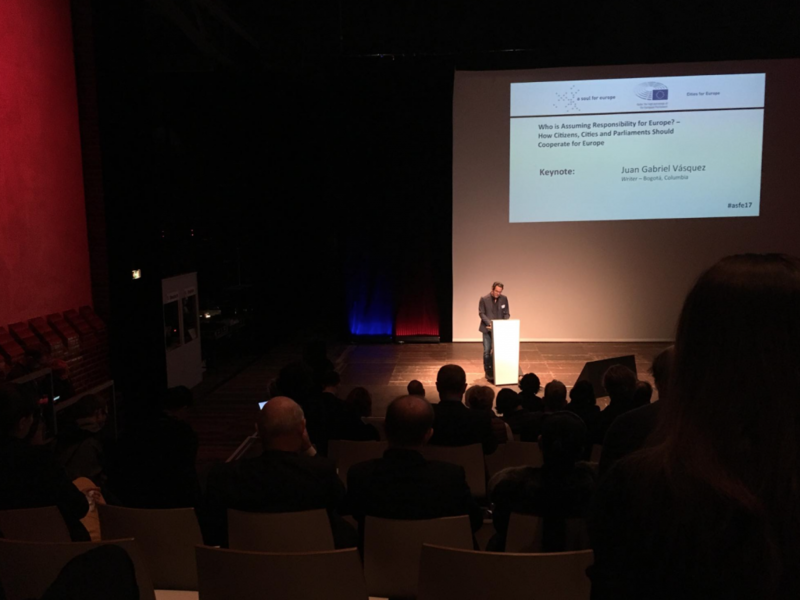 The main idea of the event is that citizens living in the cities and regions across the continent are the real owners of Europe and that their responsibility must be strengthened. Various topics will be discussed in parallel workshops and exemplary projects will be presented on the EUROPEAN MARKETPLACE, showing how active municipalities and individual citizens perceive their responsibility for Europe. The Opening Event “ A Soul for Europe“ Conference 2017 will take place on 10th November 2017 at the Allianz Forum. The conference is organized in cooperation with Actors of Urban Change, Advocate-Europe, Allianz Kulturstiftung, Centre for Fine Arts of Brussels (BOZAR), Cafébabel ENG – The European Magazine, Eurotopics Presseschau, Institut für Auslandsbeziehungen (ifa), Kulturni centar GRAD, Goethe-Institutt, internationales literaturfestival berlin, King’s College London, n-ost, Stichting Caucasus Foundation, Theater an der Parkaue – Junges Staatstheater Berlin & Das Progressive Zentrum. Join the online debate on www.medium.com/asoulforeurope, which serves as preparation for the topics to be discussed at the conference! The event is free of admission!